Forever Decorating! 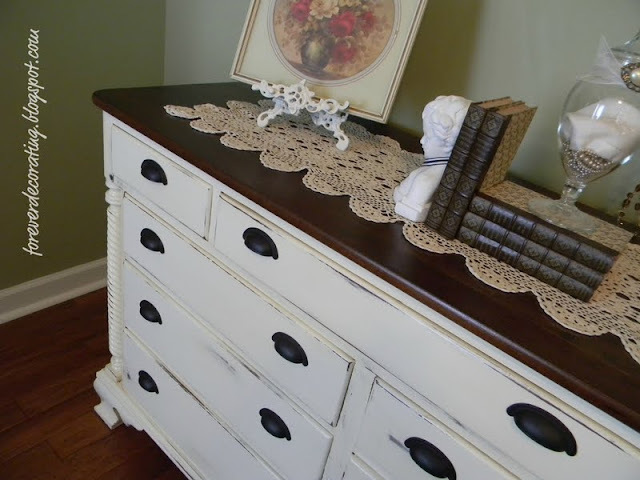 : Oh So Beautiful Dresser! Boy, Do I ever have a Lovely to show you!!! On one of my recent Diamonds In The Rough! 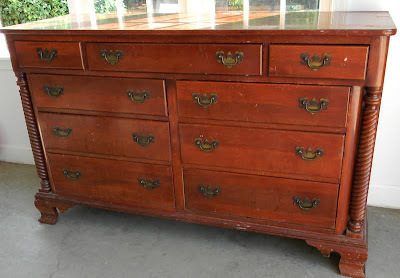 posts, I came across a very tired and abused, solid cherry dresser with great bones. At a price of only $20, how could I pass it up. It even came with a matching framed mirror. I have great vision when I see what something CAN become. 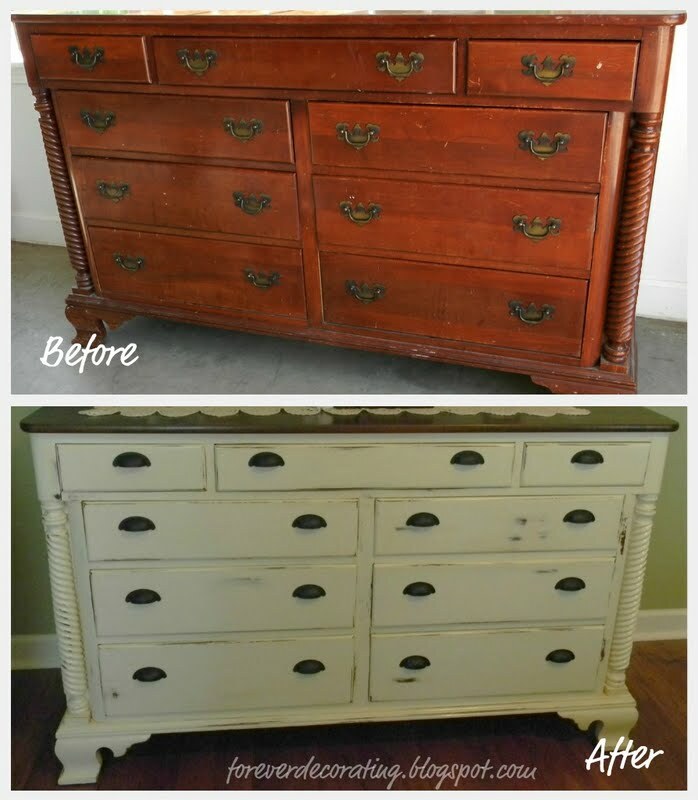 And I knew this dresser would be the beauty that she has become now. I caution all of you purists that I did paint this dresser. Yes, I know that it is a high quality piece. Yes, I know that it was made in the 1930's. And Yes, I know that I could have stripped it and restored it to its former self...but that is not what I had visioned. I sanded the top down to the raw cherry wood. I stained it walnut. 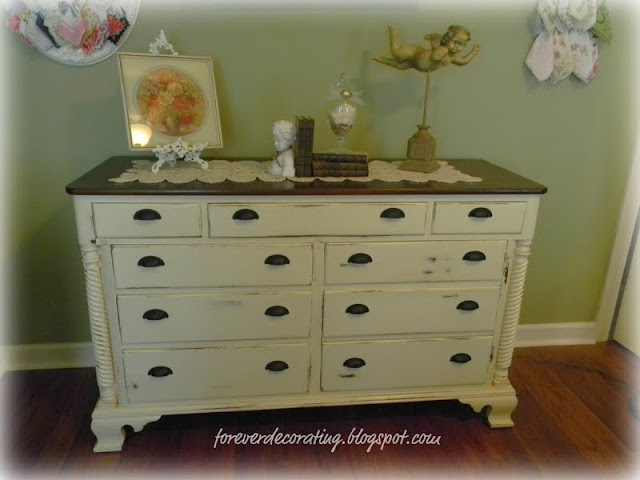 I then used my Annie Sloan Old White Chalk Paint and painted the rest of the piece. Two coats. Now instead of using the wax after I distressed it, I used Minwax's Polycrylic. It's less work than buffing the wax after it dries, gives a different patina all together and a much smoother finish. I still love the Annie Sloan Chalk Paint but I don't like using the wax on larger pieces of furniture. I discovered this by error in experimenting. I can't get over her beauty and the rope twist details on each side. The hardest part was finding new hardware for the drawers. At 2 1/2 inches apart on the screw holes, my options were limited. But I decided to update this ol' gal with vintage looking pull cups. 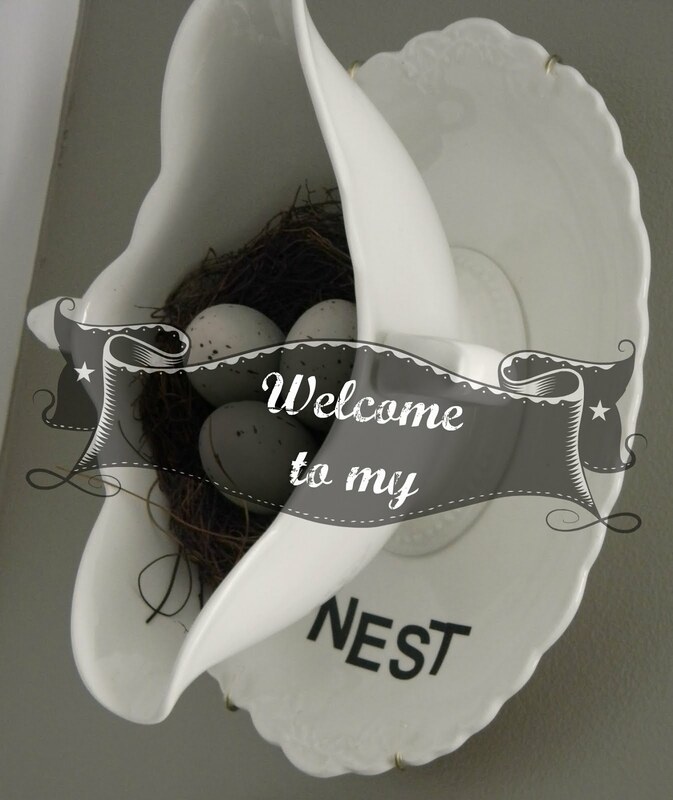 I love these anyway since they are in a brushed nickel finish in our master bath and our kitchen. And NINE (9) drawers for lots of storage. 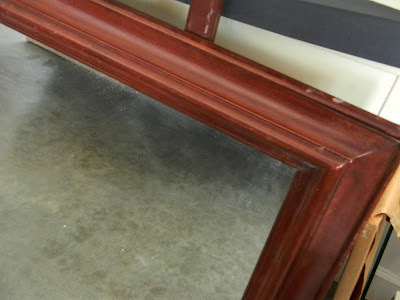 For now, I am not using the matching framed mirror, but I am thinking of using it for our guest bathroom mirror when we once again redo that room. Yes, I have a remodeling sickness. But isn't she just Lovely? SOOOO grateful for the tip on polycrylic. I hate the process of waxing and buffing. Way too much elbow grease and with the humidity here, I don't always like the results. I can't wait to try it! 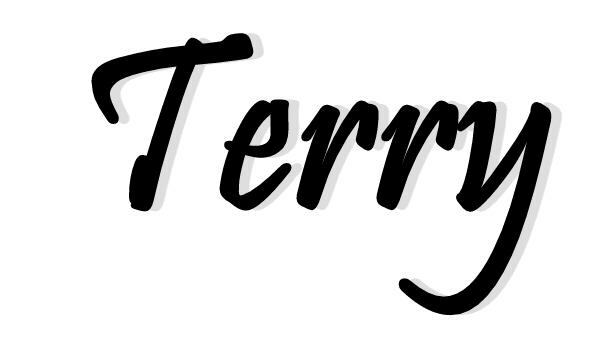 It looks great Terry! NICE JOB! Oooohhh, absolutely PERFECT! I agree with you about waxing larger pieces...LOVE my Minwax Polycrylic too!! I love your make-over! Great job! 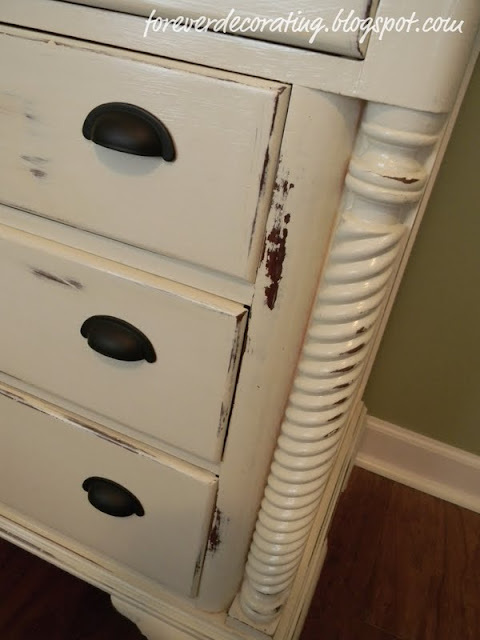 Oh I love the cup type drawer pulls you used. Just seems to add to the beauty. $20 for this beauty??? That's awesome!! It looks fantastic now, you did an amazing job! OMG!!! What I would give to run up on a deal like that!!!! It's gorgeous! I would have done the same thing. For those Purists my thoughts our "buy the piece before i do if u want to preserve it" cause i will paint it!I like the knobs too. This is just beautiful! Love the knobs, too....another piece well done!! YES, she is! I love all of the elements together...the white, the wood, the dark hardware...and only 2o bucks! good deal! Wow! This looks amazing! I would have painted it too... so don't feel too bad. Great job. Now how beeeuuuteeeful is that? Love how you combined the wood on top w/ paint on bottom! Wow! It turned out gorgeously! I have to get myself some of that Annie Sloan paint! Gorgeous...I absolutely love the mix of the stained top with the painted bottom. ASCP is everywhere and I haven't seen a project done with it that I didn't like! Another fabulous transformation Terry! Can't believe you picked it up for $20.00!!! that looks amazing! 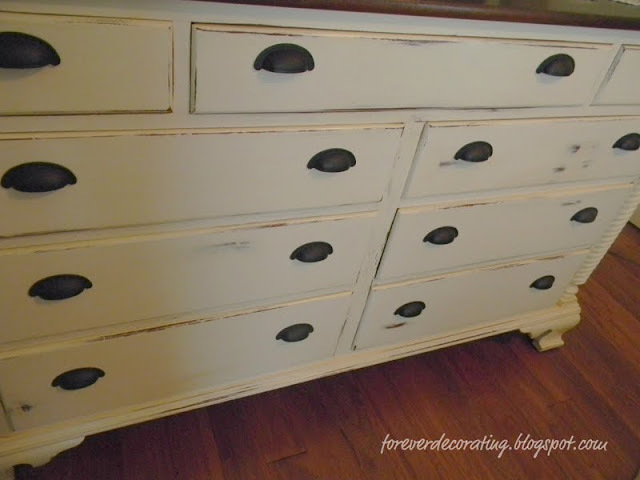 not even like the same dresser at all- love the details along the side nd the new hardware! yet another gorgeous project! thanks for linking it to my party!! Lovely make-over. Nice drawers and plenty of them too! Thanks so much for stopping by and sharing at Beach Cottage Good Life Wednesdays. Wonderful transformation! I love the twisty details on the sides! Beautiful! 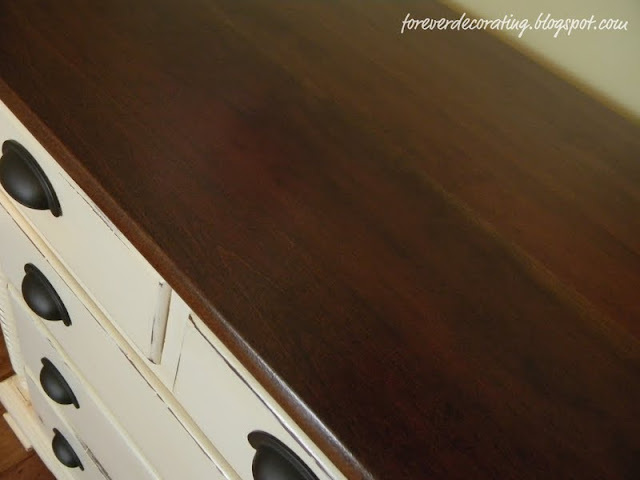 I just did a dresser too, and it's so rewarding, huh! Beautiful job! The pulls look so nice. She is a beauty! I love the details and the hardware you picked! And no need to apologize for painting her. You gave her a brand new life and a whole lot of love! I had to click over because the top view looked so much like a piece I just finished! Your dresser is gorgeous. This is gorgeous! 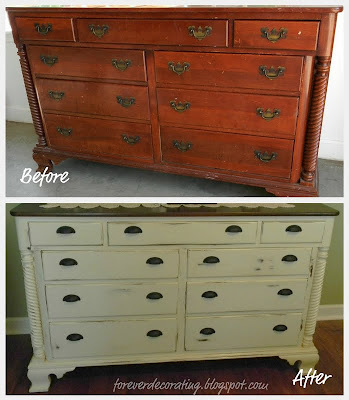 I have a dresser that I think would look great with this type of makeover. I am bookmarking this for inspiration! Golly pop! I wish I could come across a deal like that! People here in upstate SC LOVE their stuff they have for sale! A dresser like that around here would probably cost around $150 (I wouldn't pay it...but I guess some people would). You did a fabulous job on that piece! Where did you find the 2 1/2" pulls? Was it an online dealer? I love how you did this! It is just beautiful. I found you on the Creative Bloggers Blog Hop. BEEE-u-t-fulllll. Thank you for the tip on the wax. I am getting ready to do my dining room table and chairs and this will save a lot of wear and tear on my body LOL. looks gorgeous and i love the new hardware on yours as well!